Passenger vans rank the Number One culprit of all public transport services involved in road accidents with a monthly average of 19.5 accidents resulting in a monthly average of 9.4 deaths. 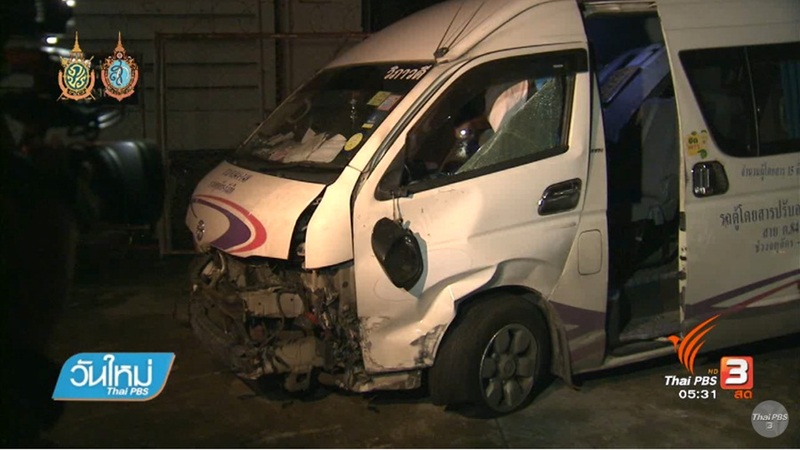 The above road accident statistics involving passenger vans were disclosed on Thursday by Mr Kongsak Chuenkrailart, coordinator of the public transport safety programme of the Foundation for Consumers. The foundation, in cooperation with the Road Safety Centre, collected data of road accidents concerning public transport during January-November period this year and found out that that passenger vans were involved in 215 road accidents, averaging 19.5 accidents per month, resulting in 103 deaths and 1,102 injuries. Reckless driving was blamed as the main cause of the accidents while the poor road worthiness from illegal modifications of the vans was blamed for the main cause of serious injuries and fatalities. Regular tour buses on fixed routes were on second place after passenger vans with a total of 141 accidents, resulting in 56 deaths and 1,252 injuries. The third on the list were irregular tour buses for involvement in 52 accidents, resulting in 47 deaths and 576 injuries. Taxis came fourth with 77 accidents, resulting in seven deaths and 84 injuries. Ordinary buses were involved in 48 accidents with 10 deaths and 75 injuries. As of October 31 this year, there were altogether legally registered 156,089 public transport which is divided into 42,202 passenger vans, including 16,002 regular vans and 24,136 irregular vans and 1,064 private vans. Kongsak said it was found out that most public transport did not have functional seat belts and safety equipment on board, many drivers are careless and not physically fit for driving due to insufficient sleep, speeding and overloading.